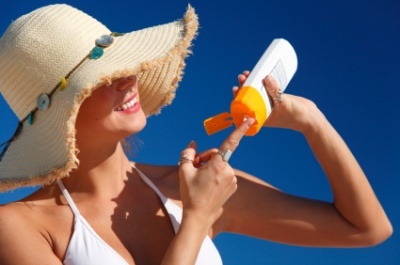 69% of women lie to themselves, saying they don’t need sunscreen. Don’t be one of them. Arm yourself with the simplest and strongest weapon we have against wrinkles, age spots, and skin cancer. Despite the fact that women know they should wear sunscreen every day of the year, only 31% do, according to a recent poll by Prevention.com. And many of those who skip SPF feel guilty about it–so much so that 31% admit they’ve fibbed about putting on sunscreen because they’re embarrassed about their bad habit. So what gives? If we all know that sunscreen helps to protect our skin from cancer and prevent signs of aging such as spots and wrinkles, why aren’t more of us using it? To find out, Prevention asked dermatologists to share some of the most common excuses women give for going outdoors unprotected. Read on and you’ll discover there’s really no good reason to skimp on sunscreen–you’ll be healthier (and younger looking!) if you use it. Sunscreens have gotten some bad press lately, including claims that they contain cancer-causing ingredients. But a recently published review of the studies on which these claims are based should ease fears. “Many of the safety concerns are not well founded–they’re based on petri dish or animal data that doesn’t relate to humans,” says Steven Wang, MD, director of dermatologic surgery at Memorial Sloan-Kettering Cancer Center in Basking Ridge, NJ, and coauthor of the review. For example, in one study, mice fed a whopping dose of oxybenzone, a UV-light absorber commonly found in sunscreens, exhibited estrogenic effects, which the researchers believe could cause cancer cells to grow more rapidly. But by Dr. Wang’s calculations, it would take more than 250 years for someone who uses sunscreen daily to be exposed to the amount of oxybenzone used in the study. Still worried? Use a sunscreen like Beyond Coastal Natural SPF 30 Sunscreen ($16; beyond coastal.com), which has zinc oxide and titanium dioxide in lieu of chemical sunscreens. You don’t have to be on the beach to soak up rays. Most people rack up 14 hours of casual UV exposure per week. And in one study, short spurts of UVA light twice a week resulted in significant damage to the fibers that keep skin smooth and firm in just 12 weeks. Makeup and a daily lotion with SPF are great steps, but “the protection is short-lived on hot, sunny days,” says NYC dermatologist Arielle Kauvar, MD. Use a sweat-resistant sunscreen with at least SPF 30 on all sun-exposed areas to be safe. Five minutes every 2 hours–that’s all it takes to apply the 1 ounce (2 tablespoons) of sunscreen recommended for protection when you’re in a bathing suit or outdoors for extended periods. And when it’s time to reapply, new sprays like Aveeno Hydrosport Sunblock Spray SPF 85 ($10; drugstores) make it less of a hassle and even adhere to wet skin. Easy, right? As long as you pick one that clearly states it blocks both UVA and UVB rays, there’s no need to break the bank when buying. “Research doesn’t show any relationship between price and protection,” reports Dr. Wang. Try Banana Boat Ultra Defense SPF 30 Continuous Clear Spray ($10; drugstores). “Skin cancer is color-blind,” warns Jeanine Downie, MD, a dermatologist in Montclair, NJ, and coauthor of Beautiful Skin of Color. In fact, skin cancer rates are increasing among Latinos–many of whom have dark skin. Mixed racial heritage may be one reason for the rise, says Vivian Bucay, MD, clinical assistant professor at the University of Texas Health Science Center. If that’s not reason enough for SPF, Dr. Downie has one more: Sun deepens dark spots common in all women of color. Her protection pick: sheer, nonchalky Neutrogena Ultra-Sheer Dry-Touch Sunblock SPF 30 ($10; neutrogena. com). Think long-term: Saggy, leathery skin is not pretty. Instead, try the subtle sheen of Hawaiian Tropic Shimmer Effect Lotion Sunscreen SPF 40 ($9; drugstores). REALITY CHECK: “This is the skin equivalent of ‘I’ve never had a car wreck, so I don’t need a seat belt,’” says Cambridge, MA, derm Ranella Hirsch, MD. Though a cavalier attitude toward sunscreen may not be a big deal when you’re young, skin loses its ability to produce melanin effectively as you get older, and that may actually make you more likely to burn. The fact is, sun damage–including wrinkles and loss of firmness–occurs whether or not you’re seeing red. And that’s a good reason to use a sunscreen like Avon Anew Solar Advance Sunscreen Body Lotion SPF 30 ($34; avon.com); it prevents burning and helps to heal past damage with a blend of antioxidant-rich botanicals. REALITY CHECK: UVB rays lead to the development of the two most common types of skin cancer, basal cell carcinoma and squamous cell carcinoma, and UVA rays penetrate deeper into the skin, triggering melanoma, the deadliest form of skin cancer. While it’s true that melanoma is usually curable when caught early, it still kills 8,000 Americans a year. And those who are lucky enough to recover from skin cancer aren’t necessarily unscathed. Take basal cell carcinomas, for instance: “They penetrate deeply and slowly destroy healthy tissue,” explains Andrew Kaufman, MD, clinical associate professor of dermatology at the David Geffen School of Medicine at UCLA. Both the biopsy and the surgery to remove the lesions can leave a scar or, in rare cases, disfigurement. Daughter burnt to a crisp even with sunscreen. Forgot to reapply. I alaways buy my sunscreen in a pharmacie so get the best advice for my skin.